I carried a 75litre backpack with the following items. Rain Gear: I took my Musto foul weather gear and was totally dry. Next time I would take fresh ingredients for the 1st nights meal as the walk into the first hut is only an 1.5 hour stroll. If you don’t have a rain cover which I didn’t make sure everything is doublebagged in black plastic bags in fact even with a rain cover this is a good idea. On Sunday I drove Annabelle to Hamilton after the night at Waitomo as the bus trip to Raglan would have taken all day. 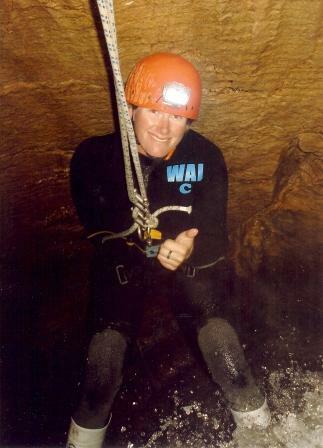 Then back to Waitomo to pick up Lisa and on to Tongariro National Park where we were going skiing. It was the last weekend the slopes were meant to be open however, a quick look at the morning ski report showed rain not snow so we took our time getting there stopping at Rapid Canoe Hire a family run business just off HW 4 near Taumarunui. We rented a two person canoe for the afternoon and went over 5 or so rapids down the Whanganui River. The owners of the canoe hire drove our car down river meeting us at a road bridge â€“ we took the car and headed south to Tongariro and they took the canoe and headed to their next meeting point further down river with the people who had spent all day on the river. The canoeing was fun and reminded me of my school trip on the Ardeche River in France. Lisa was in the front and I steered sometimes more successfully then others through the rapids. It was sometime a challenge as it was quite windy so when it came to lining the canoe up to go down a rapid you had to take the nose off the wind at the right time requiring watching the gusts etc. At one rapid I could tell we were possibly going to lose it so I did a three point turn purposely grounding the front of the canoe in a gravel island then ending up going backwards and turning to exit going forwards! Another time we ended up doing a similar maneuver however, this time not on purpose â€“ a little rusty on the canoeingJ. There were large amounts of pumice stone floating down the river so we collected pieces of the rock to put in peopleâ€™s Christmas stockings! We hoped to do the Tangariro crossing the next day (Monday â€“ a bank holiday in NZ) but the fog was dense and it was raining and blowing hard in the morning so we got in the car and drove till we found good weather at Lake Taupo. A short stop at Huka Falls where the water has carved a cleft in the rock and the water is beautifully clear and turquoise. Stopped along the road at the Bee Hive a store where you can taste different honeys just like wine tasting. Next time I come to Taupo I am going to bring my fly fishing rod and have a go at catching the world famous trout. Next stop was Orakei Korako â€˜the place of the adorningâ€™ one of the finest thermal areas of NZ it is relatively remote and therefore not packed with people. To get over to the thermal valley you take a ferry across Lake Ohakuri. There is a walking track taking you around large, colorful silica terraces, geysers and a magnificent nature cave with a pool of jade green water. Onto Rotorua a very touristy town built in the crater of a volcanoe and the area of the most energetic thermal activity in the country. We had a picnic lunch next to Lake Rotorua and visited Ohinemutu â€˜the place of the young woman who was killedâ€™ a lakeside Maori village. There is a small historic church â€“ St Faithsâ€™ Anglican with beautifully decorated interior of Maori carvings, stain glass windows and painted scrollwork. Also a large meeting house built in 1887 which was unfortunately closed up however; we peeked through a hole in one of the windows. The Bath House is a Tudor style building built in 1908 and it is set amongst very English style croquet lawns and rose gardens in the Government Gardens. We spent as long as possible in the museum there was a particularly interesting exhibit about the Maori Battalion that participated in WWII. We joined in on part of a guided tour led by a lady whose great grandfather was a mediator between the Maorisâ€™ and Europeans casting a more personal light on some of the exhibits which were actually given to the museum by her family. More time was needed here but we had a long drive back to Auckland for work the next morning. I have had a few exciting trips around the North Island with my friend Ashley. After the trek, we are going to travel back to Queenstown and drive to Christchurch.Â Along the way we will visitÂ Milford Sound, theÂ glaciers, Mount Cook and Geraldine (a small Canterbury village). Â i can’t wait to hit the South Island as everyone says that it is really beautiful and is the real NZ.